Found this at Port Orleans. All but the first pins were locked. Haven't seen this anywhere else or are they working their way every where? Interesting. I wonder if they are having a lot of thefts there? The picture seems to be working now. That's a good way of keeping someone from grabbing an entire row and walking out. Reminds me of when I worked loss prevention at an upscale department store. Any of the clothing racks near the exits had their clothes hanger hooks alternating on the bars, one facing in, the next facing out. That way someone couldn't run in, grab multiple items, lift the hangers off the bar, then run out. Saw the locks at the Disney Springs pin shop and also in the Fantasia Shop at Contemporary when we were down in December/January. I guess there was too. much "shrinkage"
Tag:I left my wife at the Rest Area!!! This seems to me to be idiotic at best. The pins are not locked to the PAPER card that now has the appearance of being locked. Looks like a huge waste of money on locks that do not accomplish anything. It looks like they are trying to deter the grab and go thieves that will just whisk off the entire row into a bag and walk out in a matter of seconds. It wouldn't be worth someones time and possibility of getting caught to stand there and detach one pin at a time. If they are spending the $$ on this deterrent, there must be a reason for it. Next step will be moving the displays by the registers so they can be monitored. We did that with POGS (yeah I'm old) at Toys R Us, and the thefts dropped dramatically. Step after that will be either locking them in a case, or just keeping 1 locked down on a display and having to ask for them at the register. 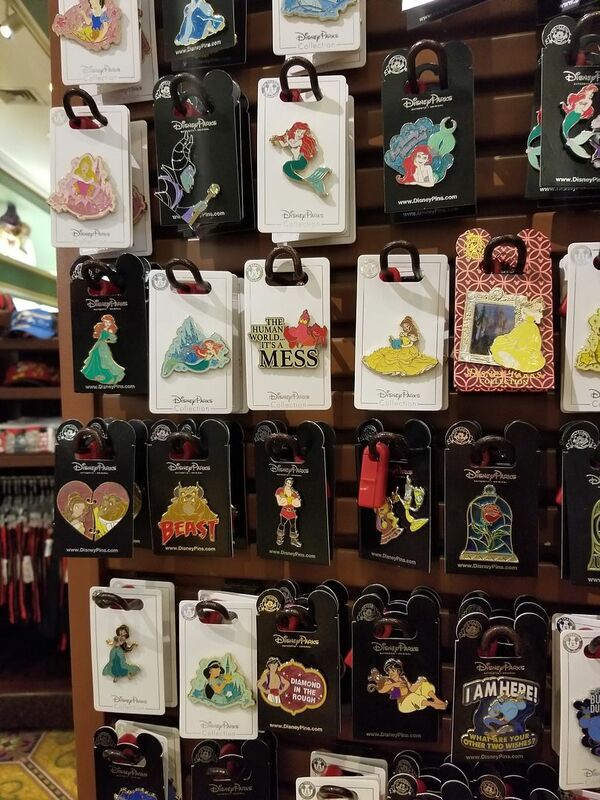 Well I guess now that pins are getting as pricey as everything else at Disney maybe they will resort to showcases like the glass ones they use for the LEs.